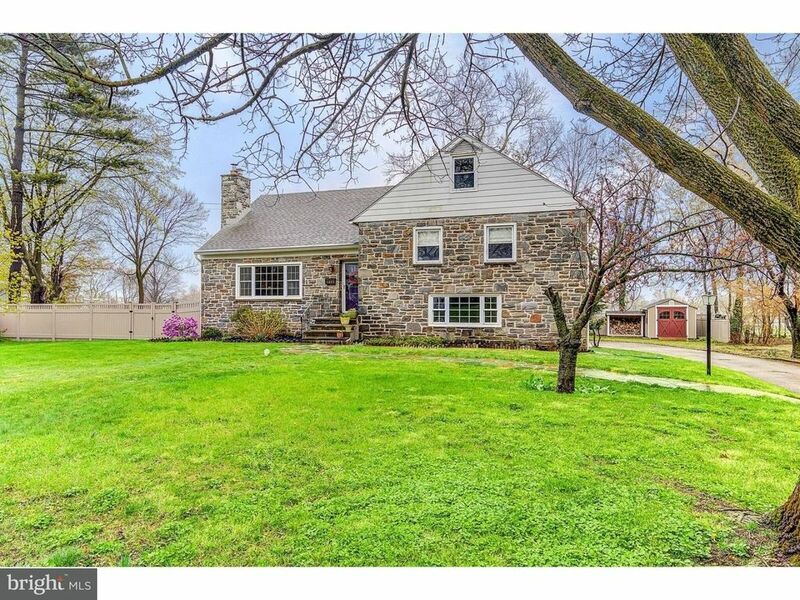 This attractive stone multi-level home has been totally upgraded and renovated in recent years! You'll love the great location with sidewalk access to parks, train station, library, shopping, restaurants, and other amenities in Bryn Mawr. Neutral d~cor, gleaming refinished wood floors, replacement windows, new central A/C, new electrical, and loads of other updates. Center Entrance Hall with coat closet, expansive Living Room with stone fireplace, sunny Dining Room with new windows and breakfast bar ledge and open views of the Kitchen. White Shaker-style cabinets, glass subway tile backsplash, under-cabinet lighting, overhead recessed lighting, and expansive counter space enhance the wonderful Kitchen. Stainless appliances include a 5-burner gas cooktop, 2 wall ovens, built-in microwave, dishwasher, and refrigerator. Just a few steps up from the main floor is a huge Master BD suite with a walk-in closet and new Master BA with neutral tile with glass tile accents, new vanity, and new toilet. Built-in shelving offer great storage space in this beautiful bathroom. 2 more Bedrooms (both with closets) are located on this level, along with a totally renovated Hall BA and Linen Closet. The renovated Bathroom has a large double vanity, neutral tile with glass tile accents, white bathtub with tiled shower enclosure, and a toilet which is nestled into a nook for privacy. Both bathrooms have radiant heat tile flooring. The 3rd floor has a HUGE 4th Bedroom with a closet and ample space for both Bedroom AND Office areas. The walk-up, floored Attic offers great storage space and also has potential for future expansion. Downstairs is a surprise Bonus Room ? with large windows and a door to the attached 2-car Garage ? which would be an ideal location for a Laundry, Mudroom, Office, or Play Room. The ground level features a large Rec Room which is partially finished with neutral painted walls and vinyl flooring. This level also has a Powder Room with window, HVAC system, and a Laundry area with a washer, dryer, & sink. A door leads out to the generously sized driveway and rear yard, which has sturdy new fencing and a gate that provides private access to the adjacent park. The covered rear porch offers great space for entertaining, with sweeping views of the unusually large yard. Other features include a stone fireplace and charming large Shed. Convenient location with easy access to universities, hospitals, corporate centers, the Blue Route, Airport, and Center City.